Add Chris Corbould to your list of motorcycle builders because he is the person behind the new Batpod, the high tech motorcycle you’ll see Bruce Wayne riding in the next Batman movie, The Dark Knight. The photos released are intentionally unclear, they want you to see the movie, naturally, but from what you can make out, I can guess we won’t see this at your local dealer any time soon. If you think a 360 is a wide tire, this bad boy sports a pair of 508s! 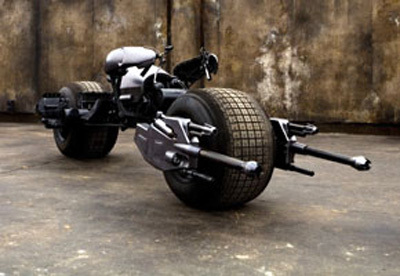 Machine guns are mounted up front, Batman actually lays down on the tank, which moves up and down and his arms fit into shields which somehow rotate around the frame to do the actual steering. There are engines in the hubs of each wheel. The footpegs are 3 1/2 feet apart on either side of the tank. Jean-Pierre Goy is the stunt rider who is the only person to have actually ridden this so far which he has been doing for the past few months somewhere in England. Hey, you wouldn’t expect Batman to ride a Gold Wing would you?